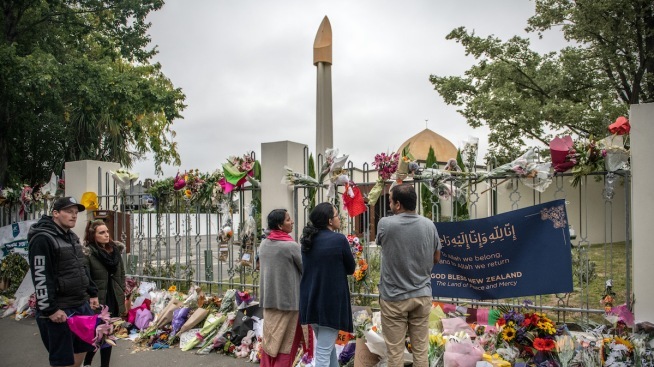 People gather outside Al Noor mosque after it was officially reopened following last weeks attack, on March 23, 2019 in Christchurch, New Zealand. 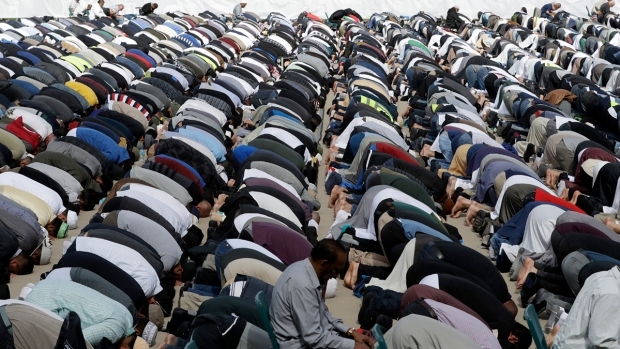 50 people were killed, and dozens were injured in Christchurch on Friday, March 15 when a gunman opened fire at the Al Noor and Linwood mosques. Inside the mosque, there were few signs of the carnage from eight days earlier. Crews had replaced windows that worshippers smashed in a desperate attempt to escape when the attacker mowed them down during Friday prayers. Bullet holes were plastered over and painted. There wasn't time to replace the carpet, which was pulled out and buried because it was soaked in blood. Shagat Khan, the president of the Muslim Association of Canterbury, said they hadn't planned to open the mosque so soon but when they saw the crowds gathering after the police cordon was removed they decided to allow people to enter in managed groups "so the mosque will be alive again." "Those who lost their families are of course quite emotional," he said. "And those who were present here during the incident, of course the memories come back. The flashbacks." The gunman killed a total of 50 people at two mosques in Christchurch on March 15, in the nation's worst terrorist attack. Australian Brenton Tarrant, 28, has been charged with murder in the attacks and is scheduled to make his next court appearance on April 5. Abdullahi Ibrahim Diriye, the uncle of the youngest victim of the shooting, 3-year-old Mucaad Ibrahim, visited the mosque with the boy's father. Diriye said he helped lift the boy's coffin to a gravesite Friday as Mucaad's mother wept. The coffin was very light with such a young child inside, he said. "Always he was a happy boy, and he liked every person he met, not only Muslims," Diriye said. Prince Hassan bin Talal of Jordan, who traveled to New Zealand to pay his respects, hugged a man at the entrance of the mosque and told him to "be patient." "He was crying deeply from his heart for a loved one he had lost," the prince later explained. "And I was saying, this is God's will, be patient. Because only through patience can you endure." "To feel that this form of violence and cruelty is visited on you, living in this idyllic part of the world, is deeply, deeply moving," he said. Jereeth Abdeen, who was visiting from Auckland, said a friend of his escaped the attack. He said he found it hard to walk through the mosque, especially after glimpsing the gunman's livestream of the attack after it was sent to him on social media before quickly closing out of the link. "It's terrible," he said. "Nobody should do that in this world." "The sad thing is the way they died," he said. "But our belief is they will be in paradise."